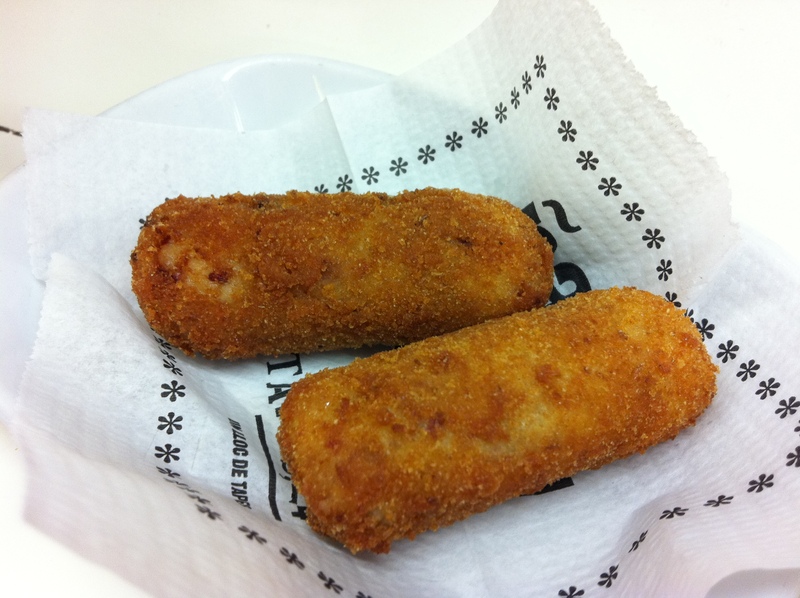 The food on offer at Tapas24 is a mixture of traditional Spanish and Catalan dishes and tapas with a twist. While the menu boasts a daily selection of lighter fish dishes fresh from the Barceloneta markets, there is a slight bias towards the salty, carb-loaded end of the tapas spectrum – crispy croquetas, deep-fried meatballs, mayo-loaded patatas bravas and more. All big, strong flavours that pack a good punch even if your palate has been flattened by a couple of bottles of beer. Which may not be such a bad thing if you plan to visit Tapas24 bang on dinner time. I’d read about the queues for this place – Abellan wanted to make it accessible to all by scrapping any kind of booking system – but didn’t really fancy rocking up at a random hour of the day just to be able to eat without waiting. And being British, a certain fondness for queueing is practically part of my genetic make up, so Carniverous Boyfriend and I decided to brave it, arriving at the restaurant at 9.30pm. The queue was about twelve tables long; not bad going for Monday night at a restaurant with a seating capacity that can’t be more than fifty covers or so. Undeterred, we gave my name to the friendly waiter at the front (‘ah, like the new Princess of Wales’, big wink, smile) and soon we’d joined the ranks of hungry diners, cold glasses of wine in hand (we were the last to arrive, but the first people to be offered drinks in the queue, which I’m putting down to our being able to speak Spanish amidst a sea of American tourists, although it may well have been our waiter’s fondness towards my royal namesake that clinched the deal). Two glasses and forty minutes later, we were through the door, appetites fuelled by both alcohol and excitement. Downstairs the room is white, bright and slightly clinical with shiny, wipe-clean surfaces. It’s the big open kitchen sitting in the middle which brings the room to life, festooned with fresh food and dried goods, and bustling with action as chefs do their thing and waiters pitch in to plate up some of the simpler dishes. The menu itself is a one-pager, made up of more traditional tapas, Commerç24 signature dishes (lifted from another of Abellan’s restaurants’ Michelin starred menu) and small dishes such as stuffed squid, braised veal and black cuttlefish rice. Additional daily specials are chalked up on boards in Catalan, but the friendly staff are happy to explain what’s what, recommending different dishes and encouraging diners to try lots of little tastes. The food here is good. 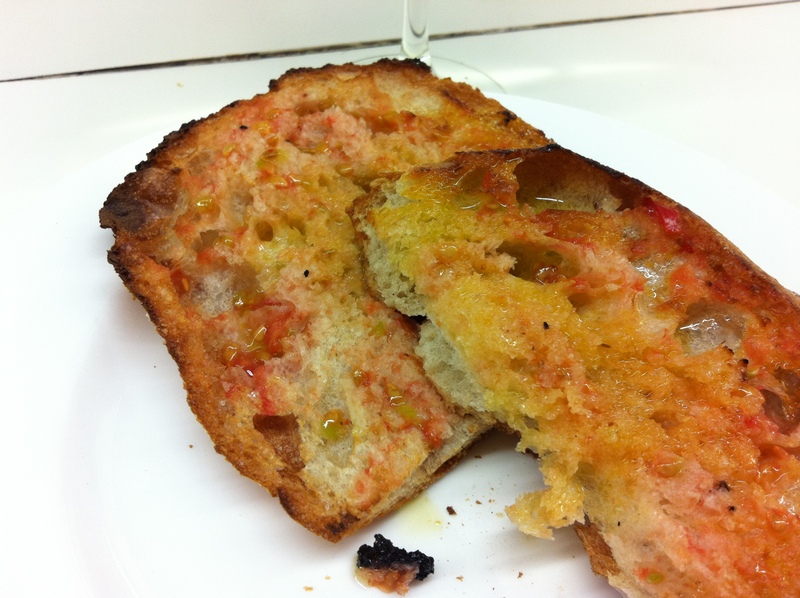 Traditional pan con tomate came charred and crusty, slicked in oil and sprinkled in salt. 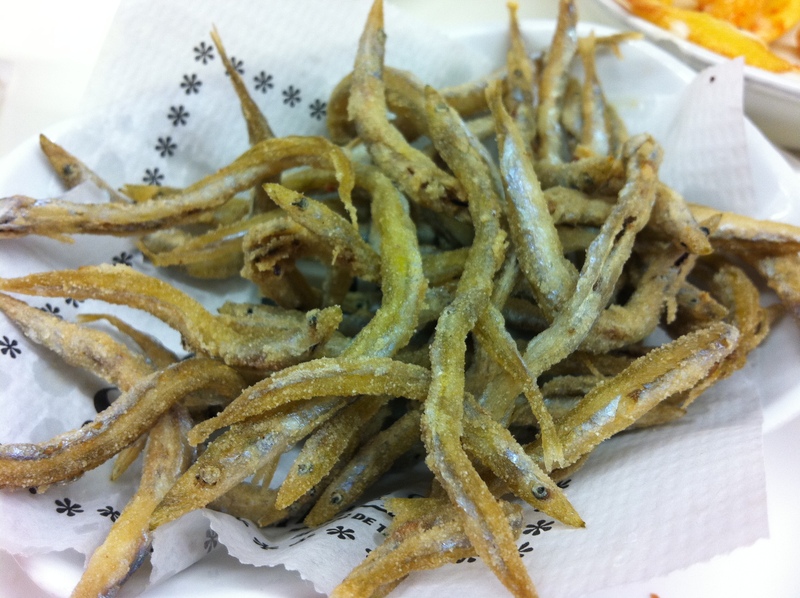 A pescaíto frito of tiny whitebait was crispy and plentiful, the croquetas richly intense; strong flavoured jamón chopped into a velvet-thick béchamel sauce. Patatas bravas heavily laden in mayo and tomato sauce wouldn’t have gone amiss in an American diner – a slight overload for my tastes – but the meatballs topped with a much smaller splodge of the same sauce combo were creamy and delicious. However, while good is fine, I was hoping for something a little more memorable from this ex El Bulli alumni. What we’d eaten so far was simply well-executed versions of the tapas you find all over Barcelona and I wanted fireworks. Luckily for me, this is where Abellan’s special signature dishes come into play. 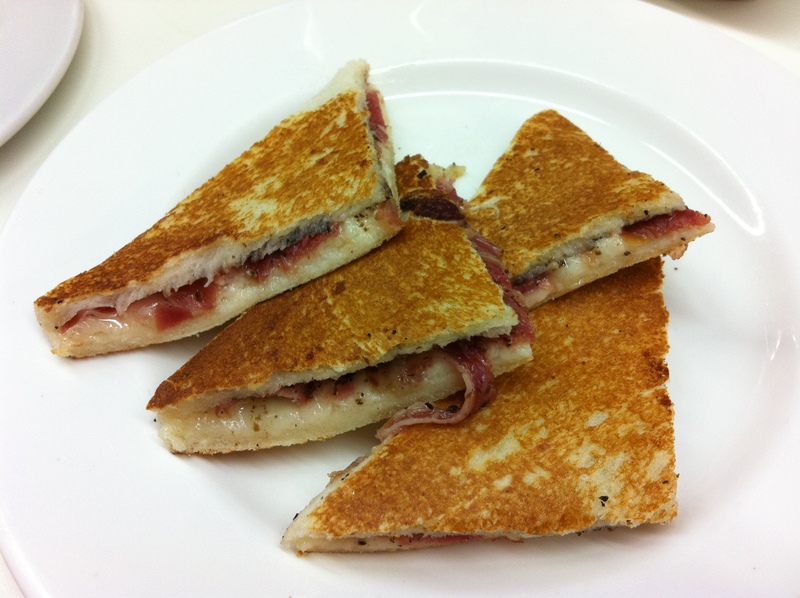 I’d heard great things about Abellan’s signature McFoie burger, and the bikini, a toasted cheese sandwich using Iberian ham, soft, stringy buffalo mozzarella and grated black truffle to bring this classic Spanish sandwich to new levels. Neither disappointed – the bikini packed with round, meaty flavours, earthy truffle and an almost plasticky squeak of stringy melted cheese, the McFoie burger another level of delicious, housed in a bun steeped in butter yet impossibly light, and accompanied by a quenelle of iced foie gras. Other, simpler dishes which particularly stood out for me were a special of chard, potatoes and leek for its grassy taste and combination of textures, and a plate of miniature catalan toasts, topped with creamy smoked aubergine, salty herring and tapenade. Dessert was slightly disappointing. 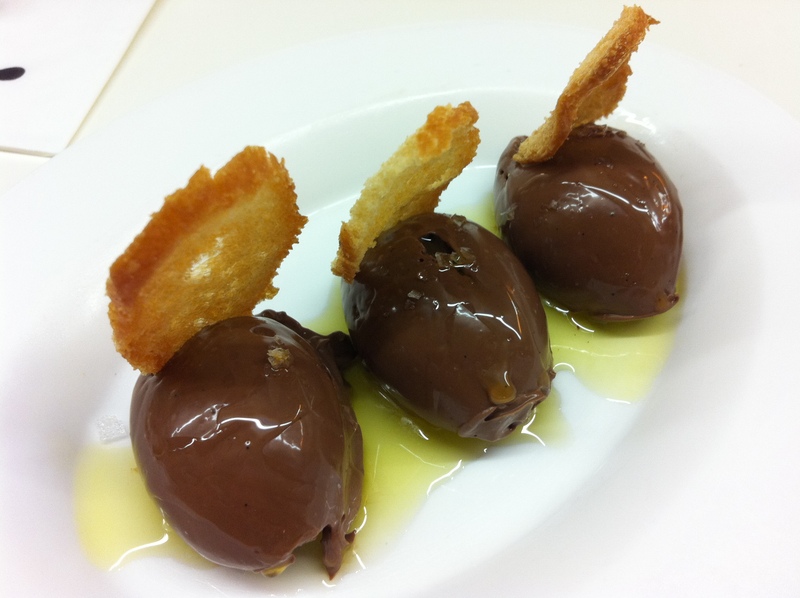 Chocolate mousse with sea salt, toasts and olive oil sounded spot on – I love salted sweets and was excited to see what the olive oil would do to the dish. The mousse was lovely, cut through with the crystals of salt, but the olive oil felt one step too far, making the dish greasy without imparting or enhancing any particular flavour. A duo of ice cream sandwiched between wafers was nice, but felt like it could have appeared on menus anywhere round the city. 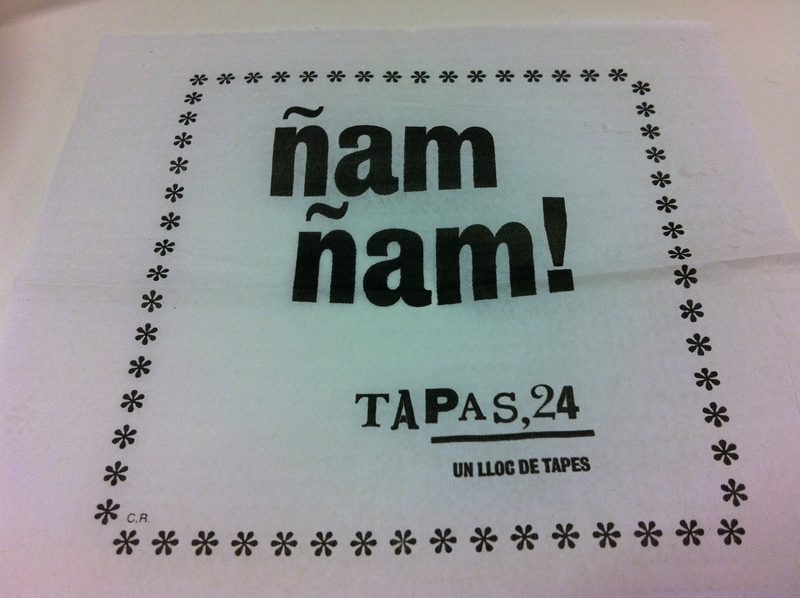 Overall Tapas 24 was a great experience; busy, bustling and fun with good food and a couple of truly exceptional dishes. It’s pretty casual inside (you’re unlikely to find yourself proposing to a loved one over the formica worksurfaces) but this is reflected in the laid back service and reasonable prices; our dinner set us back around 70 euros including service and drinks. There were a couple of disappointments, including the greasy dessert, but it’s worth going just to try the signature dishes and spot those occasional flashes of genius. Is it worth the queue? Yes. I think so. 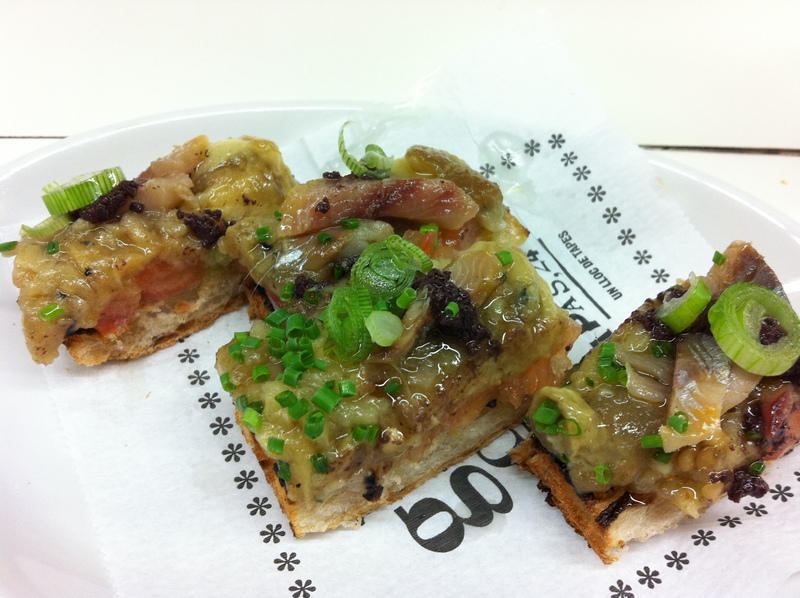 Is it the best food in Barcelona? Probably not. I imagine Commerc24 takes his cooking to the next level. But it’s a great spot to kick back, relax and try some strong, Spanish flavours. 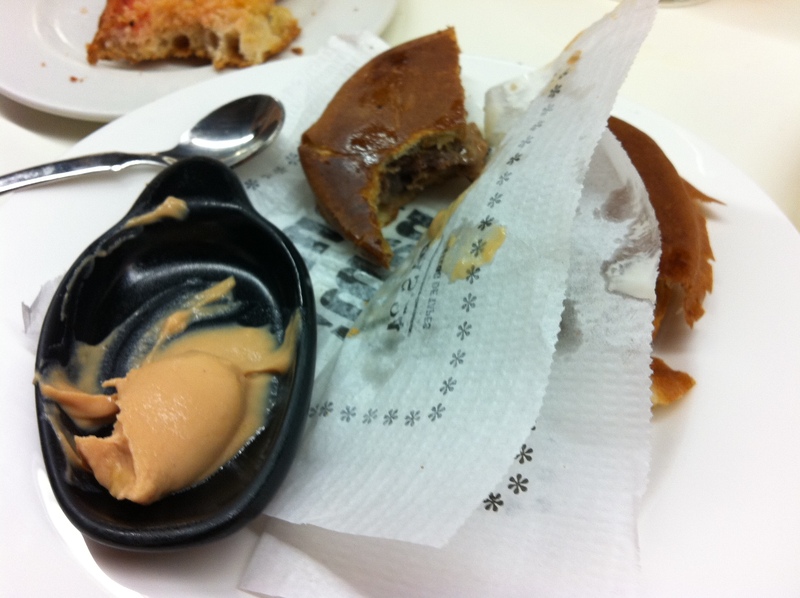 Especially if you’ve enjoyed a couple of cavas on the way, and are looking for the ultimate in midnight munchies. Beautiful write up of one of my favourite spots in Barcelona. That bikini sandwich is godly good to me. 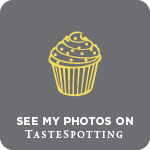 The McFoie looks awesome – iced foie gras? Yes please! You’re right, it’s not the best food in town and Comerc is a lot more refined but it’s a great place to hit up with friends and the food’s pretty solid all round. I know, it was good 🙂 I’ve read other reviews where the foie gras was interspersed with the burger meat and accompanied by a foie gras sauce that looked almost the texture of mayonnaise. The version we had put the foie gras on the side and iced – amazing!